So I've just signed up for this as my spring marathon of choice! Anyone else doing it? I'm in! Entered on Monday when my VLM ballot rejections was confirmed. Looking forward to it! Did it last year, signed up again straight away! Didn't get in to London and didn't fancy mk for a third time. Sounds like we could get a good group going then! I'm hoping with some solid training for a good time! Amsterdam marathon for me next week and then Manchester will be my focus! Yes, I think it usually sells out pretty quick, they have an early bird price on at the moment, then they hike the prices up I think? Entered Friday for the fourth consecutive year.. couldnt believe the price! £60?! Entered Liverpool too after a two year absence - £42. Yes, I'm also thinking about Liverpool, I did the half there a couple of years ago and have said since I'll be back for the marathon! I'm in, too. Went for it on the day registration opened!! Was signed up for last year's race, but due to my achilles acting up a few weeks out, I (wisely) skipped it. Just did the MCR Half yesterday on a course that shares most of the route. Very flat and despite the cold and rain, fantastic crowd support. So I'm really looking forward. I'm in as well. Ran it this year as my first marathon and as I didn't get a London place it's back to Manchester for 2019! Managed to squeeze in at 3:59 this year so looking to get a bit below that this time. I'd love to think I could target a BQ at Manchester with the right training but who knows! 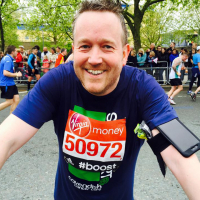 I'm in for Manchester 2019 - my debut marathon. I've done a good number of Halfs now, with a best of 1:58 at Bristol. I'm looking to finish it, firstly, and secondly do something around 4:20. Starting my training in a couple of weeks. Looking forward to the challenge and seeing how much I've got in me when the going gets tough. Am in again for 2019, my third year I think. Ran Abingdon yesterday so legs a little sore. Will look to build back up before Xmas then get into this in the new year. Looking forward to reading about everyone's training and sharing the experience. Hi All, I'm in for this. Did it once before with Mrs C having persuaded her to do a mara. It was one of the years the course was short. Telling her this means she hasn't done a mara yet is not something I'm brave enough to do! TBH, I haven't trained for a few years, relying on my poor abused body to do whatever my mind tells it. This year that body turned 50 and appears to have decided enough is enough and it could really do with a bit of training. No I don't live in North Wales, I just like ruinning there! I like hills. I'm no good on purely flat. On the basis that I do train over the winter, and train on flat rather than avoiding it I could be looking at 3:30ish. Just booked a hotel - Holiday Inn Express Manchester Trafford City. It isn't city centre but it's not far from Old Trafford, plus it has parking and free cancellation up until 5th April! After not getting in London again I am thinking I should do this again (did it in 2015 when it was short ! in 4hrs 10). I'm in for this again.Not had a good race here yet,1st time it was my first marathon so got round,then the next year I had a fall that basically stopped me at 22 miles,the this year I had to miss out due to injury. This will hopefully be my GFA attempt for the summer. 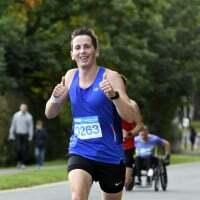 Anyone doing the Stirling Marathon 28/04/19? I've entered twice before and both times had to pull out due to injury, so I'm hoping third time lucky!! Hill1 - Did you make the start line both times or pull-out during training? What was the injury? 16 weeks to go until 7 April. I guess most folks are starting their schedules or building a base for a shorter build-up? No saintjason, didn't make the start, both times with the same calf problem, sorted now though! I'm taking advantage of a few easier weeks after doing Amsterdam end of last month, will start ramping up towards Manchester training in the next few weeks! Started this week, just building a base for the next month before deciding what type of training to do. 3.2m at 08:24 Tuesday, and 5.4m at 08:41 today (Did include a 300' ascent on mile 3!). Based on that I may be able to go sub 3:30, but more realistically looking at sub 3:45. Hope everyone had some good weekend runs? I did a steady 10 miles Saturday, followed by a 10K yesterday, felt good, will hopefully get 3 milers in this week. Hi guys, I'm new to here so thought i'd say hi. I've just signed up for this next year which will be my first time running a marathon with only having done half marathons previously! Looking forward to getting stuck into training and hoping to find comfort on here with fellow runners struggling through the cold winter months!! Hill1 - glad to hear the calf problems are behind you. How did Amsterdam go? Nice work at the weekend. Chimney - a lot of training to be banked which will improve your prospects compared to now. Guess I've started my training today,as I know I'll have a few tough weeks in December and will struggle to get the miles in. Ran 3:14 At chester so hoping for 3:09.. at Manchester.Easy 6 miles to kick off after work today.